By Tommy Goudge (September 19, 2009) – One of the main questions heading into the Fifth Annual Arrow Express Canadian Sprint Car Nationals weekend centred around the mystery driver of Tim Norman and Joe Gaerte’s #3g entry. When the final checkered flag flew on Saturday night, everyone knew who was behind the wheel of the “1.0” chassis built by Norman and Gaerte, as Shane Stewart captured the $9,000 winner’s cheque. Stewart took the lead from Tim Kelly on lap seven of the thirty lap A-Feature, and raced through slower traffic to seal the victory over hard-charging Chuck Hebing and ’08 Nationals winner Wayne Johnson. Jessica Zemken and Tim Kelly made it an all-New York front row for the fifth running of the Canadian Sprint Car Nationals A-Feature, and when the green flag dropped, Kelly got the early advantage and began to stretch his lead. Sixth starting Shane Stewart wasted no time making his way forward, and was in the fight for the runner-up spot with Zemken and Dustin Daggett by lap three. The next lap saw Stewart make his way past Zemken and into second, while Wayne Johnson and Steve Poirier were also into the top five. By the sixth lap Stewart had run Kelly down, and made his move for the lead in turn one on lap seven. Stewart immediately began to open his lead, while Kelly fell into the clutches of Johnson, who quickly took over second. With a third of the thirty lap distance in the books, Stewart began to encounter slower traffic at the back of the twenty-nine car field, allowing Johnson to close in. Just as Johnson appeared ready to challenge for the lead, Jamie Collard lost his left rear wheel at the exit of turn two and crashed, resulting in a red flag. Collard emerged uninjured but disappointed. After starting twentieth, Collard was battling to get into the top ten at the time of the incident. Once the cars had been pushed off again, Jessica Zemken’s right rear tire showed a slow leak, necessitating a pit stop for the driver who was running third at the time. On the restart, Stewart was able to keep Johnson at bay while the action heated up behind them. With half the race done, eleventh starter Chuck Hebing was on the move and into the top five. Six laps later, Hebing drove to third and began to track down Johnson, while the leaders were again in heavy traffic. With seven laps to go, Kyle Drum got sideways in turn two right in front of the leaders. Stewart was able to get by cleanly, but Johnson had to make an evasive move and lost time, allowing Hebing to close in. Only five laps remained when Hebing was finally able to get by Johnson and into the runner-up spot. Hebing closed in over the last five laps, but ran out of time to catch Stewart before the checkered flag fell. Stewart claimed the win followed by Hebing, Johnson, Paul McMahan, and Poirier. Rounding out the top ten were Jason Barney, Tim Kelly, Darren Long, Dain Naida, and Lance Yonge. “They came to me in August at the Knoxville Nationals and asked me to drive this car. They gave me an awesome car and ever since I stepped foot in it this weekend, it’s been so fast every time it touched the race track,” said Stewart in victory lane. Hebing was philosophical about his runner-up finish. 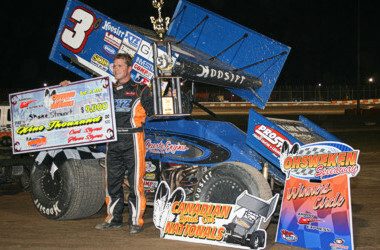 Stewart’s victory marked the second year in a row that an Oklahoma-born driver claimed the Canadian Nationals victory, following Wayne Johnson’s 2008 triumph. Ryan Hunsinger was taken to hospital to be checked over after a hard crash in his heat race, but returned to the track before the feature started. Seventy-seven drivers from five Canadian provinces and eight American states attempted to qualify for the 2009 edition of the Nationals. The father-son team of Lou Kennedy Jr. and Thomas Kennedy became the first drivers from Manitoba to compete in the Nationals, while Travis Rutz and the Pat Beck Motorsports team made the longest journey of any team at this year’s event, travelling over four thousand kilometers from Langley, British Columbia. Three teams made trips over thirty hours from Alberta to Ohsweken to represent the ASCS CanWest series in the Nationals, including Gord Kynoch who became the first Albertan to race at Ohsweken last season. Jessica Lavallee also made the trip from Alberta, as did the Richard Saumere team with Tennessee driver Paul McMahan. Glenn Styres became the first Canadian driver to claim the fastest overall lap in time trials, giving him both the Kear’s Speed Shop Top Qualifier award, and the Bicknell Racing Products Top Canadian Qualifier award. Shane Stewart, Wayne Johnson, Steve Poirier, Dustin Daggett, Tim Kelly, and Jessica Zemken won the six heat races, while Bubba Broderick, Jamie Collard, and Gregg Dalman took the three B-Mains, and seventh starter Bryan Howland ran down Trevor Lewis for the win in the Little Feature. J.R. Stewart and his #6s crew were awarded with Corr/Pak Merchandising “Roadkill Bill Peer Memorial” Best Appearing Car honours. With his fifth place finish, Steve Poirier claimed the first Inside Track Motorsport News Top Canadian A-Main Finisher award. Ohsweken Speedway wishes to thank all of the sponsors responsible for making this weekend’s events a success, including Arrow Express, Corr/Pak Merchandising, Village Pizza, Sit n’ Bull Construction, Village Café, Kear’s Speed Shop, Wiseco Piston, BS&B Radiator, Zemco Racing Products, Manton Pushrods, KSE Racing Products, Diversified Machine, Best Western Cairn Croft Hotel, Awesome Racewear, Outhouse Imaging and Design, Bicknell Racing Products, Inside Track Motorsport News, HRP Wings, J&J Chassis, Comp Cams, Grisdale Racing Products, Winters Racing Products, Seals-It, Hoosier Tire, Motorstate Distributing, Kinser Air Filters, Rocket Headers, Saldana Racing Products, Quaker State, Keizer Aluminum Wheels, and ICS Racer’s Tape. The Mod-Lites ran two features on Saturday night, which were swept by Paul Klager. Klager dominated the first feature while the battle waged for second between Jason Corless, Jamie Gilbert, and Adam Leslie. The second feature was much more closely contested, as Kory Howe and Adam Leslie made strong bids for the lead. Leslie in fact led briefly mid-race before Klager prevailed in the end. Heat races for the twenty-three Mod-Lites in attendance were claimed by Paul Klager, Kory Howe, and Josh Sliter. 1. 3g Shane Stewart, 2. 7L Darren Long, 3. 00 Ryan Grubaugh, 4. 21k Lou Kennedy, Jr., 5. 0 Glenn Styres, 6. 47x Louie Carufel, 7. 94 Stan Zanchin, 8. 84 Tyler Rand, 9. 7m Justin Martin, 10. 24k Devin Caron, 11. f36 Mike Stelter, 12. 4z Joel Lehman, 13. 51 Bryan Howland. 1. 07x Wayne Johnson, 2. 12c Tom Huppunen, 3. 35 Jared Zimbardi, 4. 21x Kevin job, 5. 10 Jeff Cook, 6. 79 Brett Mann, 7. 5b Bubba Broderick, 8. 1a John Riegling, 9. 3 Wayne Ashton, 10. 97 Jessica Lavallee, 11. 15aw April Wilson, 12. 01m Jason Martin, 13. 77x Ryan Hunsinger. 1. 28fm Steve Poirier, 2. 7 Kyle Moffit, 3. 6n Dain Naida, 4. 8r Travis Rutz, 5. 87 Jason Barney, 6. 75 Tommy Wickham, 7. 25 Michael Parent, 8. 21 Trevor Lewis, 9. 11j Chris Jones, 10. 18 Kevin Loveys, 11. 33 Doug Emery, 12. 01 Kyle Fraser, 13. 67 Chris Durand. 1. 2m Dustin Daggett, 2. 39c Paul McMahan, 3. 9 Bobby Breen, 4. 27 Jamie Collard, 5. 151kb Brian McDonald, 6. 5d Dave Dykstra, 7. 8b Alain Bergeron, 8. 14h Jim Huppunen, 9. 15k Gord Kynoch, 10. 90 James Evans, 11. 57 Doug Bowman, 12. f37 Jim Porter, 13. 14 Doug Banks. 1. 12 Tim Kelly, 2. 45 Chuck Hebing, 3. 3t Kyle Drum, 4. 49t Gregg Dalman, 5. 51L Lee Ladouceur, 6. 5m Brad Malloy, 7. 6s J.R. Stewart, 8. 8 Blake Breen, 9. 19jr Stan Zanchin, 10. 5 Keith Dempster, 11. 11 Tim Allison, 12. 71jr Jason Pietz, 13. 81 Derek Jonathan. 1. 1z Jessica Zemken, 2. 42w Rick Wilson, 3. 17j Lance Yonge, 4. 32 Justin Barger, 5. 21a Don Adamczyk, 6. 3b Scott Bonnell, 7. 71 Travis Cunningham, 8. 21j John Burbridge, Sr., 9. 52L Daniel Lampron, 10. 38 Brad Knab, 11. 9jr Tim Zack, 12. 20k Thomas Kennedy. 1. 5b Bubba Broderick, 2. 10 Jeff Cook, 3. 51 Bryan Howland, 4. 7m Justin Martin, 5. 84 Tyler Rand, 6. 79 Brett Mann, 7. 94 Stan Zanchin, 8. 47x Louie Carufel, 9. 24k Devon Caron, 10. 21x Kevin Job, 11. 0 Glenn Stryes, 12. 4z Joel Lehman, 13. 01m Jason Martin, 14. 15aw April Wilson, 15. 3 Wayne Ashton, 16. 21k Lou Kennedy, Jr., 17. 97 Jessica Lavallee. DNS: 1a John Riegling, f36 Mike Stelter, 77x Ryan Hunsinger. 1. 27 Jamie Collard, 2. 87 Jason Barney, 3. 25 Michael Parent, 4. 8r Travis Rutz, 5. 75 Tommy Wickham, 6. 21L Trevor Lewis, 7. 8b Alain Bergeron, 8. 5d Dave Dykstra, 9. 14h Jim Huppunen, 10. 11j Chris Jones, 11. 15k Gord Kynoch, 12. 90 James Evans, 13. 151kb Brian McDonald, 14. 33 Doug Emery, 15. 57 Doug Bowman, 16. 01 Kyle Fraser, 17. 14 Doug Banks, 18. 18 Kevin Loveys. DNS: f37 Jim Porter, 67 Chris Durand. 1. 49t Gregg Dalman, 2. 51L Lee Ladouceur, 3. 32 Justin Barger, 4. 5 Keith Dempster, 5. 8 Blake Breen, 6. 6s J.R. Stewart, 7. 3b Scott Bonnell, 8. 38 Brad Knab, 9. 21j John Burbridge, Sr., 10. 21a Don Adamczyk, 11. 71 Travis Cunningham, 12. 71jr Jason Pietz, 13. 9jr Tim Zack, 14. 5m Brad Malloy, 15. 11 Tim Allison, 16. 19jr Rob Ledingham, 17. 52L Daniel Lampron. DNS: 20k Thomas Kennedy, 81 Derek Jonathan. 1. 51 Bryan Howland, 2. 21L Trevor Lewis, 3. 21x Kevin Job, 4. 5d Dave Dykstra, 5. 0 Glenn Styres, 6. 8b Alain Bergeron, 7. 5 Keith Dempster, 8. 8 Blake Breen, 9. 75 Tommy Wickham, 10. 14h Jim Huppunen, 11. 18 Kevin Loveys, 12. 21j John Burbridge, Sr., 13. 47x Louie Carufel, 14. 15aw April Wilson, 15. 9jr Tim Zack, 16. 38 Brad Knab, 17. 8r Travis Rutz, 18. 01 Kyle Fraser, 19. 14 Doug Banks, 20. 71jr Jason Pietz, 21. 3b Scott Bonnell, 22. 94 Stan Zachin, 23. 7m Justin Martin, 24. 3 Wayne Ashton, 25. 19jr Rob Ledingham, 26. 01m Jason Martin. 13. 27 Ray Sliter, Jr.
1. 1 Paul Klager (Beamsville), 2. 8m Joey Mastroianni (Welland), 3. 18 Andy Tallman (Niagara Falls), 4. 28 Adam Murphy (Niagara Falls), 5. 76 Dan Kviring (Brantford), 6. 71 Shawn Sliter (Port Colborne), 7. 67 Rick Brubacher (St. Clements), 8. 37 Wally Billing (Elmira). 1. 33 Kory Howe (St. Catharines), 2. 80 Chris Steele (Fenwick), 3. 19 Jason Corless (Bolton), 4. 53 Jamie Gilbert (Welland), 5. 15 Adam Leslie (Port Colborne), 6. 5c Jordan Curran (Welland), 7. 116 Bob Bredin (Niagara Falls), 8. 27 Ray Sliter, Jr. (Ridgeway). 1. 17 Josh Sliter (Ridgeway), 2. 14 Kellie Mason (Virgil), 3. 2ez Blair Young (Niagara Falls), 4. 117 Derek Bredin (Niagara Falls), 5. 31 Scott Billing (Waterloo), 6. 88 Dave Russell (Boston, NY), 7. 4 Greg Mills(Niagara Falls). 10. 27 Ray Sliter, Jr.